We do not offer stand-alone master’s programs in Medicinal Chemistry or Pharmaceutical Sciences; however, a master's degree may be earned during the completion of the PhD. Hold a U.S. bachelor's degree or its equivalent from an accredited institution. Degree holders from non-U.S. institutions should refer to Required Academic Credentials from Non-U.S. Institutions. Take the Graduate Record Examination (GRE). The College does not have a minimum-score standard; however, successful applicants typically score in the upper range. The degree was earned from an institution where the language of instruction is exclusively English. This exception does not apply if some classes completed were taught in a language other than English. Verification from the school may be required. The degree was earned from a country where the official language is English (e.g., United States of America, Australia, England). All applicants to our PhD programs use the online application provided through the Rackham Graduate School. Note: Our PhD programs do not generally accept applications to do PhD work with specific faculty. The normal process is to apply to the PhD program through the Graduate School (as described). Your application will then be considered along with all the other applications we receive. During their first year, our students perform research rotations in faculty labs, and at the end of the winter term, students are matched with a faculty member who will mentor them through their PhD studies. Rackham will not process an application without the application fee, nor can the College review applications prior to the payment of this fee. The fee is waived for applicants to the Medicinal Chemistry and the Pharmaceutical Sciences program who are U.S. citizens or permanent residents. Some fee waivers are available from the Rackham Graduate School; for more information click here. The scores must be available to the program by the application deadline. The advanced test in chemistry is desirable, but not required. Send your scores electronically to Institution Code 1839. One set of all official undergraduate and graduate transcripts with a degree posted or in progress must be provided. An unofficial copy can be uploaded electronically with your application. Official copies must be submitted directly to the Rackham Graduate School. A concise (1-2 pages), well-written statement about your academic and research background, your career goals, and how the PhD program will help you meet your career and educational objectives. A concise (500-word limit) essay that describes how your background and life experiences, including cultural, geographical, financial, educational, or other opportunities or challenges, motivated your decision to pursue a PhD in our program. Please do not simply restate your Academic Statement of Purpose. These should be written by people capable of evaluating your academic progress and potential for graduate study. Letters must be submitted directly by each recommender. Recommenders should submit their letters using the online application site. This is the preferred method of submission; so please be sure to enter information for each of your recommenders on your application as required. If a recommender is unable to access the site after you have submitted your application, he or she can email the letter directly to the PhD program. It is the responsibility of the applicant to ensure that the letters of recommendation are submitted by the deadline. Late letters may result in a delay in processing your application. Click here for more information on submitting letters. For information about TOEFL and other test scores that the Rackham Graduate School will accept, click here. TOEFL scores are sent electronically from ETS directly to the University of Michigan (institution code: 1839). After admission to the program: The Affidavit of Financial Resources and Immigration Information for International Students, with supporting documentation, is required. This form is necessary, regardless of funding. Complete department mailing addresses, as well as program information, are available via these links. Is an online application required at the University of Michigan? Yes, all applicants are required to apply online. This allows your application and fee to be sent directly to the appropriate places, enabling us to process your application much faster. The application fee is automatically waived for U.S. citizens and permanent residents applying to the Medicinal Chemistry and Pharmaceutical Sciences programs only. All other applicants must pay the fee. Some applicants may qualify for application fee waivers or grants that are available from the Rackham Graduate School; for more information click here. Can I have my application evaluated without paying the fee? No. The fee must be paid before an application can be processed or evaluated. I am an international student. Do I need to have all of my transcripts, diplomas, and certificates translated? Yes. Everything must be translated, and both the originals and translations must be submitted. When evaluating applications, we look at the whole picture and every piece is important. This is why we wait until we have all of your documents before we will look at your application. Strong letters of recommendation are key. All students must take the GRE, and international students must take one of the following English proficiency tests: the TOEFL, the IELTS, or the MELAB. How long are GRE, TOEFL, IELTS, or MELAB scores valid? The GRE score is valid for five years. TOEFL, IELTS, and MELAB scores are valid for two years. What is the minimum TOEFL (or IELTS, or MELAB) requirement? The minimum TOEFL score is 560 for paper-based tests and 84 for IBT tests; the IELTS minimum score is 6.5; the MELAB minimum score is 80. I'm an international student but I am getting a degree from a U.S. institution. Do I need to retake the TOEFL? No. If you have, or will have, a degree from a U.S. institution prior to enrolling at the University of Michigan, you will not need to retake the TOEFL (or the IELTS or MELAB). Do I have to submit my recommendation letters together? The preferred method for submitting recommendations is via the online application. Those who are recommending you can complete this online form and attach the letter of recommendation online. Both the Recommendation Form and the letter are needed. You can forward the Rackham Graduate School link to your letter writers and they can download the form themselves. Who should write recommendation letters for me? Strong letters of recommendation are essential; therefore you should choose your recommenders carefully. Choose faculty who know you well and can speak to your strengths, preferably from your area of research interest. A letter from a professional, or a key educational administrator might also be appropriate. Letters from personal friends or family members are discouraged. Do I have to submit both the Recommendation Form and the letter? Both the Recommendation Form and the letter are needed. If necessary, you can forward the Rackham link to your letter writers and they can download the form themselves. I'm interested in a master's degree but I don't see information about master's programs on your website. Do you offer any? No. The College of Pharmacy does not offer a program that culminates in a master's degree. However, some students earn a master's in the course of completing their PhD degree. This is your chance to show the admissions committee who you are. You should talk about your background, your educational, research, and career goals, and how our graduate program will help you realize those goals. Note that this differs from the personal statement. I sent my official transcripts to Rackham Graduate School. Do I have to send them to the department as well? No. The department will use the unofficial transcript that is submitted with the applicant's online application. Only Rackham must have original, official transcripts or mark sheets, bearing the institution's official seal. Please note: Rackham Graduate School conducts a complete audit of each transcript. Due to the high volume of documents being audited, it may take 7 to 14 business days for the notice of receipt to appear online. The College of Pharmacy has a long history of funding most, if not all, of its graduate students, but such support is not guaranteed. Financial aid comes in the form of departmental fellowships, research assistantships, and student instructorships. Funding for successive years is contingent upon the availability of funds and a student's academic performance for the previous year(s). I am interested in learning more about the research being done at the College of Pharmacy. How can I find out more? 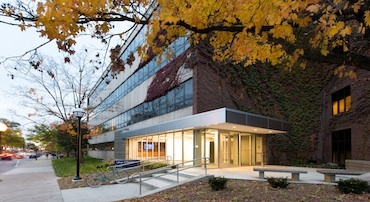 Graduate programs at the U-M College of Pharmacy are highly regarded for their interdisciplinary emphasis and are directed by faculty with international reputations for excellence in research and teaching. To learn more about their research, go to the department sites and click on the faculty links. I am an international student. Do I need to fill out the Affidavit of Financial Resources and Immigration Information for International Students? Rackham Graduate School will notify you to submit the Affidavit of Financial Resources and Immigration Information for International Students only if you are offered admission by the academic program. Please do not submit this form with your application.